These perspectives were possibly drawn as lecture drawings or for exhibition at the Royal Academy but were not actually used as such. The drawings show a variety of decoration for the exterior of the Mausoleum. Drawing 69 shows the Mausoleum built in brick and the lantern built in stone with a single urn at the centre of the canopied dome. It is very close to drawing 66 with steps leading up to arches on the three exposed sides of the Mausoleum. Whereas drawings 70 and 71 show the whole Mausoleum built of stone with additional urns at the upper corners of the lantern. They both have three Roman altars at the base with alternative designs and variations of incised grooves and Greek key decoration on the pilasters. The domed altars of drawing 71 display the funereal motif of an eagle killing a snake. The drawings make the Mausoleum appear detached from the rest of the building, as a free-standing structure. In drawing 69 this is achieved by reducing the almshouses to a single-storey block, as seen in earlier designs. In drawing 70 foliage is used to disguise the almshouses. It is to give dominance to the Mausoleum, which became the centrepiece of the new building. In drawings 70-71 urns are placed within small niches in the wall of the central arch of the Mausoleum. Nevola writes that these niches are reminiscent of 'an ancient Roman Colombarium... illustrated frequently in Piranesi's Antichita Romane'. These were vaults for the reception of cinerary urns. 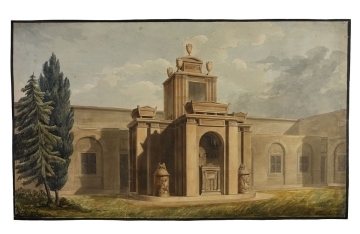 All the drawings for the Mausoleum demonstrate a fascination with the funerary architecture of antiquity and contribute to the sepulchral quality of the building. Drawing 70 is the closest to the decorative scheme of the Mausoleum as executed. The three projecting porches were furnished with sarcophagi, the canopied dome of the lantern was decorated with five funerary urns and two cylindic Roman altars were positioned at the base of the Mausoleum. However, the arched openings of the porches were actually fitted with pedimented door cases. 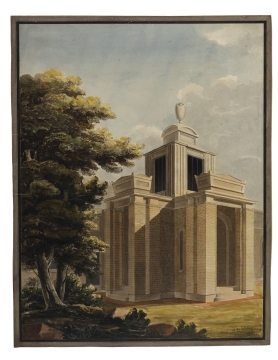 Also, as seen in drawing 69, the lower storey of the Mausoleum was in fact built of London stock brick and only the lantern and decorative features were made in Portland stone. 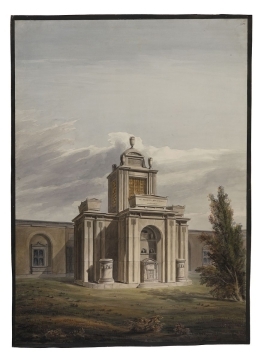 Chantrell drew the ambitious view of drawing 71 on 11 June 1812 by which date the Mausoleum was already being constructed in brick, recorded in the progress view of drawing 93, dated 29 May 1812. It was clearly an ideal design.